Paris Saint-Germain are reportedly keen on prising Toni Kroos away from Real Madrid, and are willing to spend up to €80m on the German midfielder. Kroos, 29, joined the Spanish giants in 2014, and has since gone on to make 226 appearances for the club and has played a key role in an impressive trophy haul. The German ace has won a La Liga title, three Champions League trophies as well as four Club World Cups among many others during his time in the Spanish capital, and he continues to play a fundamental role as he’s on course to make over 40 appearances in a single campaign for the fifth straight year. 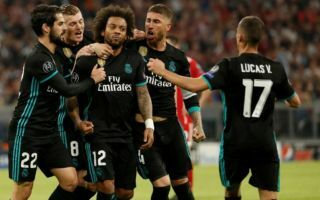 With Zinedine Zidane returning to the Bernabeu last week and given his history with Kroos as he relied on him heavily during his first stint in charge, it would seem to be more than enough to end all speculation over his future. However, as noted by Calciomercato, via OK Diario, PSG are said to be ready to offer €80m to test Real Madrid’s resolve and sign a world-class player to add to their already star-studded squad. It’s added in the report that Kroos surprisingly isn’t considered to be unsellable, and so such a hefty offer could tempt the Spanish giants into selling and investing that money back into the squad to help Zidane rebuild. Given Kroos continues to feature heavily and is showing little sign of decline in his game though, they will surely try to hold on to him and build around him with other high priority areas to address. From a PSG perspective, after suffering further disappointment in the Champions League this season, adding a player like Kroos to their squad would certainly add belief and a major reinforcement to help finally end their wait for success in Europe’s premier competition.